But something even more important might be emerging. For years, there have been some who predicted that when the Arctic sea ice melted, that the tremendous quantities of methane stored in the Arctic sea floor above Russia and North America would begin to be released into the atmosphere. The process would become an escalating feedback loop where the retracting ice reflected less sunshine back into space, the open water absorbed more sunlight, heating the water, forcing the ice to retract further, etc. Then the increasingly warming water would warm the sea floor, releasing the methane frozen there. The methane release is considered to be important in the extreme because, as a greenhouse gas, methane is said to be twenty times more influential than carbon dioxide; and the amount of methane stored in the Arctic is said to have more heat-producing capacity than all of the other fossil fuels combined. Whether that quantity claim is perfectly accurate or not, it is agreed that there’s a lot of methane there. The release of the methane would then accelerate the feedback loop by rapidly warming the atmosphere so that ultimately people would be calculating sea level rise in meters per decade rather than centimeters. Now a multi-nation task force claims that there has been a dramatic increase in methane emissions in the Arctic. They say the process has recently escalated beyond their expectations. 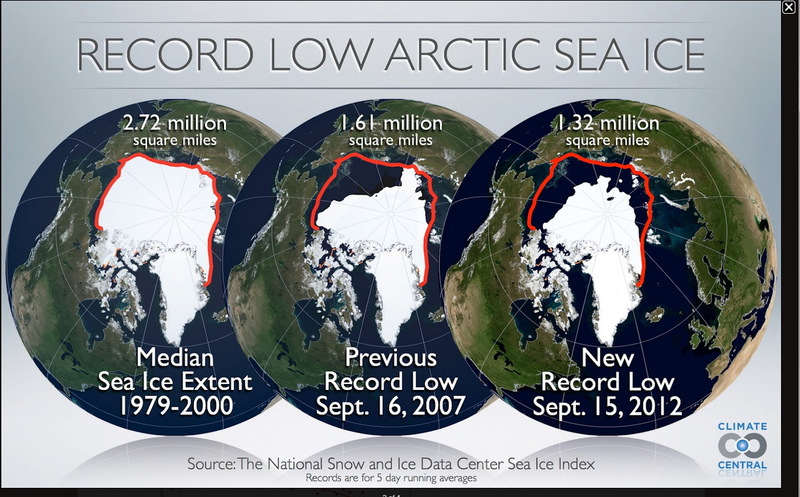 They believe a runaway feedback loop has likely begun and that the arctic could see an ice-free Summer by 2015 rather than the more generally-accepted predictions that this would not happen till sometime between 2030 and 2050. This gives an indication of the trend, though that trend also includes a persistent and significant thinning of the ice as well, which is not pictured. Over the last year, those who monitor Arctic methane using aircraft flyovers say that large plumes of methane, some as wide as a kilometer, can be detected above both open Arctic sea water and cracks in the sea ice. This is a new development. Previously, only small plumes could be detected, and typically only near the Siberian coast where methane was escaping from melting permafrost on land. Strong methane emissions from the ocean floor can be seen in the 19 minute video Arctic Methane: Why The Sea Ice Matters. The video does an excellent job of explaining a lot of this and notes that, like many other places on the planet (see What is the Transition? Part 1), the Arctic is seeing an increase in seismic activity that could contribute to additional methane releases. More can be read about this topic here. Because there was no human body count, the mainstream media ignored it, so few heard about this late-March megastorm. 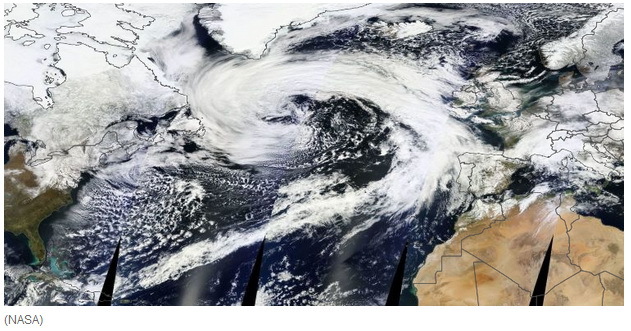 It did contribute to unusually wintry weather in the UK, killing many animals there. And if you are reading this in mid-May, 2013, you might wish to check in daily with Spaceweather.com. Sunspot AR1748 has already thrown off four X-class solar flares. Luckily, the CMEs (coronal mass ejections) from those flares have not been sent directly toward Earth, but the rotation of the Sun is bringing AR1748 into more direct alignment with the Earth in the coming days. Images of the four X-class flares are here. This entry was posted in Transition and tagged climate, extreme weather, sea level rise, space weather, storms, weather by Thundering Heard. Bookmark the permalink.